Bulls season over as Wizards advance with 75-69 win. John Wall finished with 24 points, Nene scored 20, and the Washington Wizards beat the Bulls 75-69 on Tuesday night to clinch their first-round series in five games.Bradley Beal scored 17 points, and the fifth-seeded Wizards advanced in the postseason for just the third time since the 1970s. They will meet Indiana or Atlanta in the Eastern Conference semifinals.It’s a huge step for a franchise that hadn’t been to the postseason since 2008, but with Wall and Beal leading the way, they won 44 games during the regular season.The Wizards turned a halftime tie into a nine-point lead heading into the fourth quarter and hung on down the stretch.The Bulls comeback chances took a big hit early in the final quarter when Taj Gibson crumbled to the court clutching his left ankle after he tried to block a layup by Wall with the Wizards up by six points. He had to be helped off the court and did not return.The Bulls cut it to 70-67 on a jumper by Carlos Boozer with 3:32 left. Wall then poked the ball away from Boozer and nailed a jumper at the shot-clock buzzer. The Bulls hit two free throws with 2:18 remaining to cut it back down to three, but the Wizards grabbed three offensive rebounds while whittling more than a minute off the clock before Beal threw the ball away with a minute left in the game.Boozer missed on a drive, but the Bulls had another chance after a shot-clock violation by Washington with 22.4 seconds left. Jimmy Butler missed on a layup off the inbounds, and the Wizards caught a break after Andre Miller missed two free throws.Beal tracked down the loose ball and hit the first free throw to make it 73-69 with 14.6 seconds left before missing the second. But again, the Wizards got the rebound. This time it was Nene, and that led to two free throws by Wall with 7.8 seconds remaining.Wall and Nene, back from a one-game suspension for grabbing Butler’s head, both had seven rebounds. Marcin Gortat scored just two points but grabbed 13 boards.For the Bulls, a season that unfolded in ways they never envisioned is finally over. They expected to challenge Miami for supremacy in the Eastern Conference with Derrick Rose back after sitting out last season, only to lose their star to another season-ending knee injury. As if that wasn’t enough, they traded away one of their top remaining players in Luol Deng yet somehow squeezed out 48 victories. No team in the East won more games after New Year’s Eve, either, but the Wizards were too much.Butler and Kirk Hinrich scored 16 points each and Gibson had 12. Joakim Noah added 18 rebounds and seven assists. Boozer, a candidate to be amnestied, added 10 points and nine rebounds in what might have been his final appearance for the Bulls.Hinrich’s 3-pointer gave the Bulls a 46-45 lead with 9:02 left in the third. But the Bulls managed just six points the rest of the quarter – a 20-foot jumper by Noah, two free throws by Boozer and a bank shot by Butler with 2:16 left.Beal, who scored eight points in the third quarter, answered by banking in an 18-footer and Wall added a free throw in the closing minute of the period to make it 61-52. NOTES—Nene declined comment about his suspension at the Wizards’ shootaround, saying, ”I don’t want to talk about that.” … Former Bull Ben Gordon was on hand, and Bryan Bickell of the Blackhawks was cheered when he was shown in the second quarter. Hawks explode for 4 goals in third period, put Blues away 5-1. Duncan Keith had a goal and three assists, and the Blackhawks used a four-goal third period to finish off the St. Louis Blues with a 5-1 victory in Game 6 of their first-round playoff series on Sunday.The Hawks won four in a row after a slow start in St. Louis. The defending Stanley Cup champions will play the winner of the Minnesota-Colorado series in the Western Conference semifinals. The Avalanche lead the Wild 3-2 heading into Game 6 in Minnesota on Monday night.Jonathan Toews, Patrick Sharp, Andrew Shaw and Keith scored in the third period as the Blackhawks improved to 14-2 in home playoff games over the last two seasons. Corey Crawford made 35 saves, keeping his team in a tie game when St. Louis controlled the second period.T.J. Oshie scored for the Blues, who outshot the Blackhawks 36-27. Ryan Miller finished with 22 saves.St. Louis went 0 for 6 in 10 minutes of power-play time over the first two periods, wasting a chance to take the lead. The Blues went 2 for 29 with the man advantage for the series.The Blackhawks also struggled on the power play, but they scored when it mattered most.With Jay Bouwmeester in the box for tripping, Keith made a nice stop to keep the puck in the St. Louis zone, then fired a pass over to Toews. The captain beat Miller over his right shoulder for a 2-1 lead just 44 seconds into the third period.It was Toews’ third goal of the series. He also scored on a breakaway in overtime of Friday night’s 3-2 win.Toews’ 23rd career postseason goal seemed to take the air out of the Blues, and it got even worse for St. Louis. Sharp got loose for a breakaway, shook off a stick to the face by defenseman Kevin Shattenkirk and slid a shot past Miller.Sharp’s first point of the playoffs sent a charge through the towel-waving sellout crowd of 22,144, and there were mocking chants of “Mil-ler! Mil-ler!” as Shaw added his second goal of the series and helped set up Keith for his second.It was an eerily similar playoff exit for St. Louis to a year ago, when the Blues also were eliminated by the defending Stanley Cup champions in six games in the first round. In that 2013 playoff series, St. Louis won the first two games at home against Los Angeles, then lost four in a row.This year was supposed to be different, especially after the Blues acquired Miller from Buffalo on March 1. But they lost their last six games of the regular season, putting them in a first-round series against their rivals, the Hawks.St. Louis rebounded for two 4-3 overtime victories, but the Blackhawks found their stride when the series shifted to Chicago. Crawford had a shutout in Game 3, Patrick Kane scored in overtime in Game 4, and Toews’ breakaway score in St. Louis put the Blackhawks in position to advance.Brent Seabrook returned from a three-game suspension. Seabrook was punished by the NHL for his wipeout hit on Blues captain David Backes in Game 2.Backes exacted a measure of revenge when he delivered a hard hit on Seabrook into the end boards in the second period. But Seabrook added two more assists and had six points for the series.Bryan Bickell redirected Seabrook’s high slap shot past Miller for a 1-0 lead 4:12 into the game. Alexander Steen skated behind the net before finding Oshie in front for the tying score.The Blues outshot the Blackhawks 17-3 in the second, but couldn’t beat Crawford. St. Louis had one shot trickle across the goalmouth, keeping it tied at 1. NOTES—Kris Versteeg was scratched after he played in the first five games. F Joakim Nordstrom was active for the first time. … Keith tied a playoff career high with four points. The Wizards did just fine without the suspended Brazilian forward. They scored the first 14 points and beat the Bulls 98-89 on Sunday to take a 3-1 lead in the Eastern Conference series. Nene or not, the Wizards did what they’ve done all series: Take a quick lead and force the Bulls to use up energy trying to catch up. It was 15-8 in Game 3, 29-12 in Game 2, 19-13 in Game 1. Washington, seeking to win a playoff series for only the third time since the 1970s, can finish off the Bulls on the road in Game 5 on Tuesday night. Gibson went 13 for 16 from the field, but his teammates combined to go 22 for 62. He made more field goals in the first half (8) than the rest of the Bulls combined (7). Mike Dunleavy, who scored 35 points in Game 3, scored only six.Dunleavy jammed his left thumb attempting to take a charge in the fourth quarter. The thumb was swollen and was X-rayed after the game, but he said he didn’t think it was broken. Trevor Booker started in Nene’s spot and had nine rebounds and three blocks. Beal called Booker “a huge X-factor” — apparently the Wizards are cornering the market on that particular commodity. 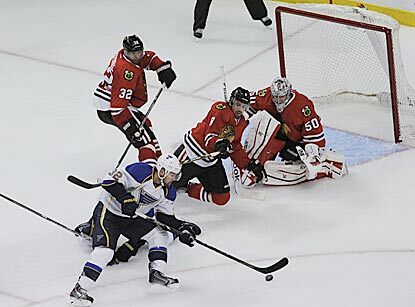 Toews overtime break-away goal moves Hawks past Blues 3-2, one win from advancing. ST. LOUIS—Jonathan Toews caught the St. Louis Blues’ defense napping after the Blackhawks got a lucky carom.Just like that, the puck was in the net and the defending Stanley Cup champions were in command of the first-round series. Blackhawks goalie Corey Crawford stopped a shot by David Backes, defenseman Duncan Keith cleared the puck and the rebound deflected off Andrew Shaw’s shin pad all the way to the Hawk captain alone at center ice off a change. Toews sped in with two defensemen in futile pursuit and threw a few fakes at goalie Ryan Miller before slipping a backhander into the net. St. Louis defenseman Roman Polak saw Toews coming off the bench but reasoned that the Blues had control, so he left the ice about the same time Backes was shooting. Replacement Jay Bouwmeester never had a chance and Toews also got behind Jordan Leopold. Marian Hossa and Ben Smith also scored for the Blackhawks, who have won three in a row and can wrap up the first-round series at home Sunday. Four of the first five games in the series have gone to overtime. All three of the Blues’ home games went to overtime and St. Louis won the first two.Before Toews scored, the top offensive threats in the series had been neutralized in Game 5. Patrick Kane and Toews combined for one assist in regulation and the Blues’ Vladimir Tarasenko, who entered with an NHL-leading four goals in the playoffs, was held to two shots.The first four goals came from players scoring for the first time in the series.Pietrangelo entered averaging more than 31 minutes in the series, most on either team, but has been a reluctant shooter with five shots in the first four games. His second career playoff goal came on a 2-on-1 break with Jaden Schwartz with the teams at 4-on-4 to tie it at 2 early in the third.Backes returned for the Blues while Blackhawks defenseman Brent Seabrook finished a three-game suspension from the illegal hit that knocked the St. Louis captain woozy in Game 2. But the Blues didn’t make the most of that emotional lift early, getting their first scoring chance at about the 12-minute mark, totaling one shot on two early power plays and trailing 1-0 after the first.The Blackhawks started the scoring for the third straight game, capitalizing when Polak got caught pinching at the blue line. Bryan Bickell led a 2-on-1 break and Hossa tapped his own rebound into a wide open net at 16:11 of the first period.On his knees, Oshie lifted a backhander over Crawford’s stick to tie it at 11:04 of the second period. Six minutes later, Smith tapped in a backhander after a St. Louis defender stopped Sheldon Brookbank’s slap shot from the point. NOTES—All three games in St. Louis have attracted standing room crowds, with 19,796 showing up on a busy sports night downtown with the defending National League champion Cardinals playing the Pirates a few blocks east. … Oshie totaled three shots and was minus-3 his first three games back from an illegal check to the head late in the regular season from Minnesota’s Brian Rupp, who was suspended four games. Oshie said Thursday he might have returned a game too soon. … Hossa entered second in the playoffs with 21 shots but was held to one assist the first four games. WASHINGTON—The forgotten man in Games 1 and 2, Mike Dunleavy nearly had the best scoring game of his career.Dunleavy scored 35 points, one short of his career-high, and Jimmy Butler hit a go-ahead 3-pointer with 24 seconds remaining as the Bulls hung on Friday night for a 100-97 win over the Washington Wizards, trimming the deficit to 2-1 in their Eastern Conference first round series.Dunleavy made a career-high eight 3-pointers on 10 attempts, and the Bulls went 12 for 24 beyond the arc. After Butler’s final 3, the teams traded fouls and free throws. Washington had a chance to tie when Taj Gibson missed a free throw with 3.1 seconds to play, but Trevor Ariza threw the ball out of bounds after grabbing the rebound in a miscommunication with teammate John Wall.Game 4 is Sunday in Washington. The Bulls are attempting to become only the fourth NBA team to win a seven-game series after losing the first two at home.Bradley Beal scored 13 of his 25 points in the fourth quarter for the Wizards. Wall had 23 points and seven assists.Dunleavy scored 20 points combined in the first two games, but he passed that total early in the second half. His four-point play in the third quarter — completed after he was clobbered by Beal outside the arc — helped steady the Bulls in a game in which neither team led by double digits.Beal had reason to be frustrated. During a walkoff interview with CSN at halftime, the Wizards guard guaranteed Dunleavy wouldn’t score in the second half.The game was played at the Wizards’ faster pace, yet retained much of the physical play preferred by the Bulls. The chippiness evident in the games at Chicago resurfaced in the fourth quarter when Nene and Butler went forehead-to-forehead, with the Wizards forward grabbing Butler by the back of the neck and the side of the head.Both were assessed with techncials, and Nene was ejected with 8:28 to play.It had been six years since the Wizards hosted a playoff game, and, for a while, Wall appeared to embody the pent-up energy all by himself. He completely dusted Kirk Hinrich with a stutter move at the free-throw line and drove for a layup, capped a fast break with a windmill slam and performed a 360 move that was so breathtaking it almost didn’t matter that he missed the layup.Dunleavy was on target Friday night from the get-go. He slammed his hands on the floor in frustration after he didn’t get the ball from Butler for an open 3-pointer early in the first quarter, but his teammates had no trouble finding him after that.Dunleavy scored 10 of the Bulls’ first 14 points and was 6 for 8 from the field with 16 points at halftime. The Wizards were so intent on guarding him at the arc that he was able to pump fake a 3, then drive to the lane for a three-point play.Neither team was about to let the other pull away. Dunleavy hit another 3 to start the fourth quarter, part of his six points in a 9-0 run that gave the Bulls a seven-point lead, but the Wizards kept responding.Wall, however, missed two free throws with 1:27 to play and the score tied. The next score was the 3-pointer from Butler. NOTES—After a plea from owner Ted Leonsis to show up on time, the Wizards fans did a better job getting to the arena for the opening tip, although there were still sections with plenty of empty seats. Fans were given red, white or blue T-shirts, and Leonsis did his part by showing up in a blue coat, red sweater and white shirt. …Joakim Noah got into a confrontation with a Wizards security official during the Bulls’ shootaround Friday morning. Washington coach Randy Wittman said his team was to blame. “That’s got to be something from our side that shouldn’t happen,” the coach said. 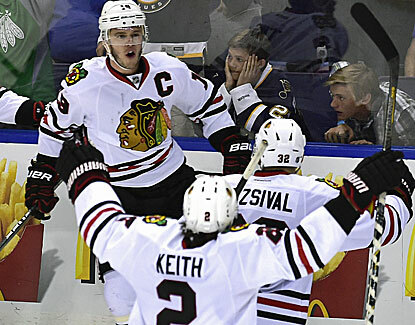 Kane’s second goal of game(in OT)gives Hawks 4-3 win over Blues–Series tied 2-2. Patrick Kane scored his second goal of the game at 11:17 of overtime, and the Blackhawks beat the St. Louis Blues 4-3 on Wednesday night to even their first-round playoff series at two games apiece.Kane carried the puck down the left side as teammates Ben Smith and Brandon Saad rushed toward the net, and beat Ryan Miller with a well-placed wrist shot for his 32nd career postseason goal.Andrew Shaw and Bryan Bickell also scored for defending Stanley Cup champions, who blew a 2-0 second-period lead. Jonathan Toews had two assists and Corey Crawford made 30 saves.Game 5 of the best-of-seven series is Friday night in St. Louis.Vladimir Tarasenko scored two goals for the Blues, and Miller finished with 30 stops. Maxim Lapierre also scored his first goal of the series.Tarasenko’s fourth goal of the playoffs made it 3-2 at 12:26 of the third, but Bickell tipped Michal Rozsival’s slap shot past Miller to tie it with 3:52 left in regulation.Kane, who won the Conn Smythe Trophy as playoff MVP last season, had a shot go off the crossbar earlier in overtime. It was his best game of the series after he missed the last part of the regular season with a leg injury.The Blues were without captain David Backes again after he was scratched for the second straight game with an upper-body injury. Backes hasn’t played since he absorbed a big hit from Blackhawks defenseman Brent Seabrook in the third period of St. Louis’ 4-3 overtime victory Saturday.Seabrook served the second of his three-game suspension, giving Sheldon Brookbank his second straight start with top defenseman Duncan Keith.Blues forward Brenden Morrow also was scratched after coach Ken Hitchcock said earlier in the day that he would miss the rest of the series. Morrow missed the final three games of the regular season with a foot injury. He played in Games 1 and 3 against the Blackhawks.Playing in front of another loud sellout crowd, the Blackhawks controlled the first period and much of the second. Bickell had a shot go off the right post with 3:37 left in the first.The Hawks used their maligned power play to grab the lead in the second. St. Louis defenseman Alex Pietrangelo had his stick knocked away by Toews, who fired a shot that went off Shaw’s right skate and popped up in the air. Shaw then swiped it in with a backhand for his first goal of the postseason at 8:40.It was the Blackhawks’ second power-play goal in 17 opportunities for the series.Kane got an assist on Shaw’s score, and then scored one of his own to make it 2-0 at 16:09. Defenseman Johnny Oduya made a beautiful cross-ice pass to a streaking Kane, who shot it over Miller’s glove for his second of the series.St. Louis appeared to be in big trouble before Kane committed a delay of game penalty with 1:16 left in the second, giving the Blues an opening. Just seven seconds into the resulting power play, Tarasenko beat a screened Crawford for his third goal of the series.It was the Blues’ second power-play goal in 21 chances in the series.St. Louis then got another late-period goal when Lapierre’s shot went off the right post and then Crawford’s left shoulder before going into the net with 3.1 seconds to go. Five of the Blues’ goals in the series have come in the final two minutes of a period. NOTES—Blues C Derek Roy returned after missing Game 3. … Blues C Vladimir Sobotka was shaken up after a big hit from Bickell in overtime, but quickly returned to the ice. Bulls go cold at wrong time, fall to Wizards 101-99 in OT, head to DC down two games to none. Bradley Beal came on strong late in regulation to finish with 26 points, Nene scored six of his 17 in overtime and the Washington Wizards beat the Bulls 101-99 Tuesday to take a 2-0 lead in their first-round series.Washington rallied from 10 down in the fourth quarter after blowing a 17-point first-quarter lead.Nene scored the first six points in overtime after being held in check by Defensive Player of the Year Joakim Noah in regulation, and the Wizards hung on after Kirk Hinrich failed to convert at the foul line in the closing seconds.Noah had just hit two free throws when Beal missed a jumper with 18 seconds left. Jimmy Butler got the rebound and called time.Hinrich, a 76-percent free throw shooter this season, had a chance to tie it after getting fouled by Nene on a drive with 2.4 seconds left. But his first attempt hit the rim. He deliberately missed the second, and Trevor Ariza grabbed the rebound to seal the win for Washington.D.J. Augustin led the Bulls with 25 points. Taj Gibson had 22 points and 10 rebounds. Noah added 20 points and 12 boards, but the Bulls will have to dig themselves out of a huge hole after dropping two at home.John Wall had 16 points and seven assists for Washington.The Bulls appeared to be in good shape up 87-77 five minutes into the fourth and were still leading 91-85 when Beal, quiet in the second half, shot the Wizards back into the game.He nailed a 3-pointer that made it 91-88 and added a floater to make it a one-point game. Then, with a chance to put Washington ahead, he hit 1 of 2 free throws with 52.9 seconds left to tie it at 91.Both teams had opportunities to win it in the closing seconds but couldn’t convert.Augustin threw up an air ball, setting off a scramble that led to a jump ball between Gibson and Nene. Beal controlled the tip, but after a timeout, he missed an 18-footer along the baseline as time expired.The Bulls were trailing 64-61 with just under six minutes left in the third when they went on an 8-1 run for their first lead of the game.Mike Dunleavy Jr. put them ahead 65-64 with a jumper, and he capped that spurt with a layup that made it a four-point game with about four minutes left in the quarter.The Bulls were leading 87-77 after a driving layup by Noah and two free throws by Butler with 6:59 left regulation. Crawford shut’s out Blues, Hawks win 2-0. Corey Crawford was there every time. Slap shots, wristers, backhands and tips, he stopped each one of them.The Blackhawks needed a rebound game from their goaltender, and he delivered in a big way.Crawford made 34 saves in his third career postseason shutout, and the Blackhawks got back into their playoff series with the St. Louis Blues with a 2-0 victory in Game 3 on Monday night. Jonathan Toews and Marcus Kruger scored as the defending Stanley Cup champions bounced back after a pair of overtime losses in St. Louis. Toews’ 21st postseason goal was only the second score by a Blackhawks forward in the series. “Three games in a row. It’s been a very intense series and extremely close,” Joel Quenneville said. Ryan Miller shook off another slow start and finished with 23 saves, but Toews’ shot at 4:10 of the first went through the goaltender’s legs and was the only score for most of the game. “It’s not a good goal. We’ll leave it at that,” Miller said. It was quite a turnaround for Crawford, who was upset with his play after Saturday’s 4-3 loss. Barret Jackman’s winning goal in Game 2 went through Crawford, prompting the goaltender to say he had to play better for the Hawks to win.Quenneville met with Crawford on Sunday, and he responded with one of the best games of his career. Crawford drew chants of “Co-rey! Co-rey from the capacity crowd at the United Center. He was helped by a sound performance by Duncan Keith and Hawk’s defensemen, who stepped up without the suspended Brent Seabrook.The Blackhawks killed three St. Louis power plays, while the Blues’ penalty-kill unit went 4 for 4, including a 5-on-3 disadvantage in the second. The Blues, who scored tying goals late in regulation in each of the first two games, pulled Miller with 57 seconds left, but the Blackhawks held on. Kruger stuffed home an empty-netter in the final seconds.Game 4 is Wednesday night at 8:30.Each team was without a key contributor after Seabrook wiped out Blues center David Backes with a big hit in Game 2. The five-minute major and game misconduct penalty for Seabrook led to Vladimir Tarasenko’s tying power-play goal with 6.4 seconds left.Seabrook was suspended for three games by the NHL, putting Sheldon Brookbank in the lineup for the first time in the series. Playing with Keith, Brookbank turned in a solid performance in his 19th career playoff game.While Backes was out with an injury, center Patrik Berglund returned for the Blues after missing three games. Berglund, who had 14 goals and 18 assists this season, skated behind the net for a nice wraparound opportunity in the first period, but was turned away by Nick Leddy.Seabrook’s hit on Backes, and at least one knee-on-knee blow by Bryan Bickell, increased the tension between Central Division rivals. But Game 3 was surprisingly civil, with each team wary of another penalty that could swing the series. There was a lot of chirping from each side, and that was about it.Looking for a spark, Quenneville put Toews, Patrick Kane and Bickell on the same line for the start of Game 3. The trio had a lot of success in the Blackhawks’ run to the title last year.The move worked.Toews connected from the top of the left point in the first, beating Miller with a shot that took an unusual bounce. Bickell also created a couple of quality chances with some slick passing. “If that’s how it’s going to go in, then we’re doing a good job of taking care of the clean chances and the easier ones for them,” said Blues defenseman Kevin Shattenkirk, who was right in front of Toews on the goal. “We just have to keep going. NOTES—Blues F Vladimir Sobotka went to the locker room after he took a power-play shot off his right arm in the second, but he returned later in the period. 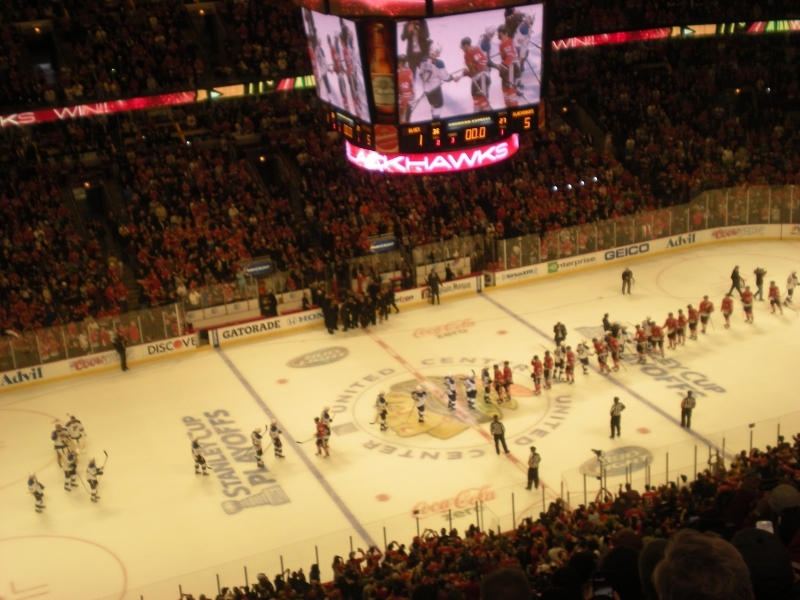 … The announced attendance of 22,112 was the 268th consecutive sellout for the Blackhawks, counting the playoffs. Wizards outscore Bulls 30-18 in fourth quarter to steal game one 102-93. Nene dominated with 24 points, Trevor Ariza scored 18, and the Washington Wizards rallied from 13 down to beat the Bulls 102-93 in their playoff opener on Sunday night.John Wall scored 16 in his postseason debut. Marcin Gortat added 15 points and 13 rebounds, and the fifth-seeded Wizards pulled out the victory even though they looked like they were ready to be blown out.They cut a 13-point deficit to one in the third and trailed by three going into the fourth, before outscoring the Bulls 18-6 over the final six minutes to come out on top in their first playoff appearance since 2008.Game 2 is Tuesday.Gortat’s layup started the decisive run, and Trevor Ariza gave the Wizards an 88-87 lead when he hit a pair of free throws with 4:17 remaining. Jimmy Butler tied it with one of his own, but a layup by Gortat and basket by Nene made it 92-88, and Washington hung on after Joakim Noah cut it to two on a tip-in with 2:11 left.Gortat hit two free throws and added a jumper with 34 seconds left to make it a six-point game, and the Wizards took the early lead in the best-of-seven series.Nene dominated from the start and hit 11 of 17 shots. Andre Miller came on strong down the stretch to finish with 10 points, and the Wizards pulled this one out even though Wall and Bradley Beal (13 points) combined to shoot just 7 of 25.Kirk Hinrich and D.J. Augustin each scored 16 points, and Butler had 15. Taj Gibson added 12 points, Mike Dunleavy Jr. and Carlos Boozer each scored 11, and Noah added 10 points and 10 assists. But after posting more wins since Jan. 1 than any other Eastern Conference team, the Bulls find themselves in a hole.They led by 13 early in the third and were up 69-57 midway through the quarter when the Wizards went on a 13-2 run to make it a one-point game.Ariza’s 3-pointer cut it to 71-70 with 3:32 remaining. Noah answered with a layup and Gibson hit two free throws to make it a five-point game, but a basket by Miller made it a three-point game going into the fourth.The Bulls overcame a 14-point first half by Nene and took a 54-48 lead to the locker room after a strong second quarter.Augustin drove for a three-point play with just over a minute left to finish the first-half scoring and start a 13-3 run that stretched into the third quarter.Gibson blocked a driving Wall with about 24 seconds left in the half, and the Bulls continued to pour it on after the break.Dunleavy, who missed all five shots in the first two quarters, heated up in a big way in the third. He started the quarter with a 3-pointer and kept it going after Ariza hit one of his own.Butler answered with a layup and a 3, and Hinrich capped the run with a driving reverse layup to make it 64-51 with 9:50 left in the third. NOTES—The Bulls and Washington are meeting for the third time in the playoffs. The Bulls swept a first-round matchup, 3-0, on the way to their fifth championship in 1997(the final three games that Washington was known as the Bullets), and then as the Wizards, the knocked off the Bulls 4-2 in the first round in 2005-after the Bulls had won the first two games of that series….Hinrich is the only player on either current roster who also played in that 2005 series.